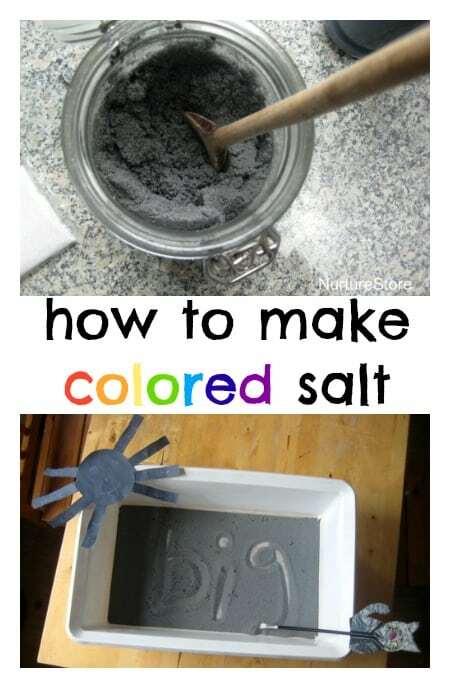 Here’s another idea in our recipes for play series, this time showing you how to make colored salt, which is great for sensory play and learning. You only need two ingredients to make coloured salt: salt of course, and some paint. We use a water-based poster paint (tempera). You can add in some glitter for a bit of extra sparkle if you are so inclined. You can use whatever color you like – we’re going with black for some Halloween-themed salt. 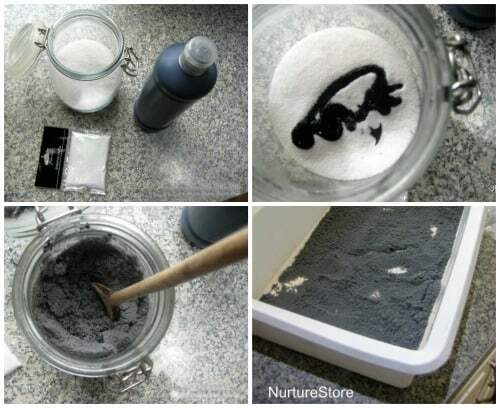 If you store the salt in an airtight container, it will last for ages. 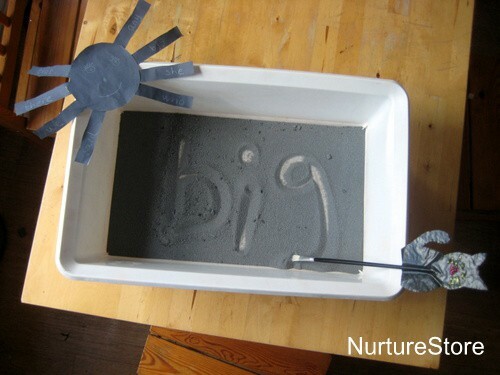 It’s great as a base for sensory play and particularly good for practising mark making, writing and spellings. We’re using our salt tray to do some writing and spelling work. You can use a finger, pencil or paint brush to write in the salt. It will hold the shape of the letters so you can see them, and it offers a great sensory experience of the words, as you can feel the words as you write. 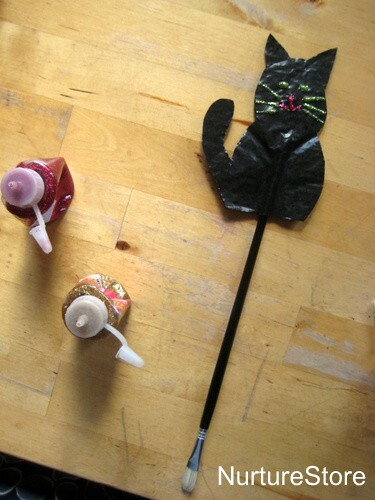 We decided to make a black cat to go on the end of our paint brush, to give a Halloween-theme, and to please my cat-mad daughter. 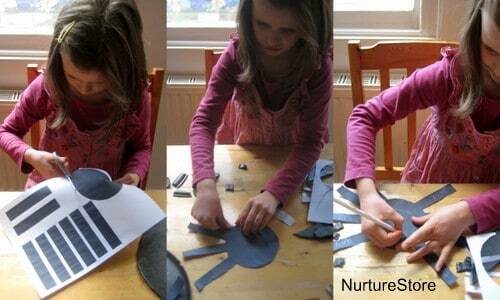 Cut out the body and legs of the spider. Stick them together. Use a white pencil to draw on eyes and a mouth, and to write your spelling words on the legs. You can write on any words you like, to suit what your child is learning. You might want to just write letters for very young children, or let them simply try out making some marks. 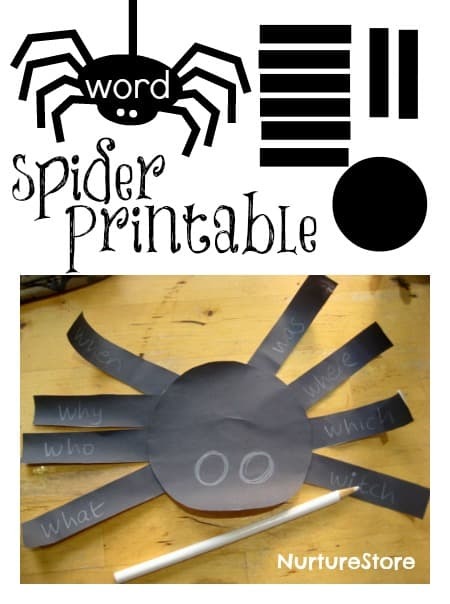 Or write some sight words, or your child’s weekly spelling or vocabulary words. 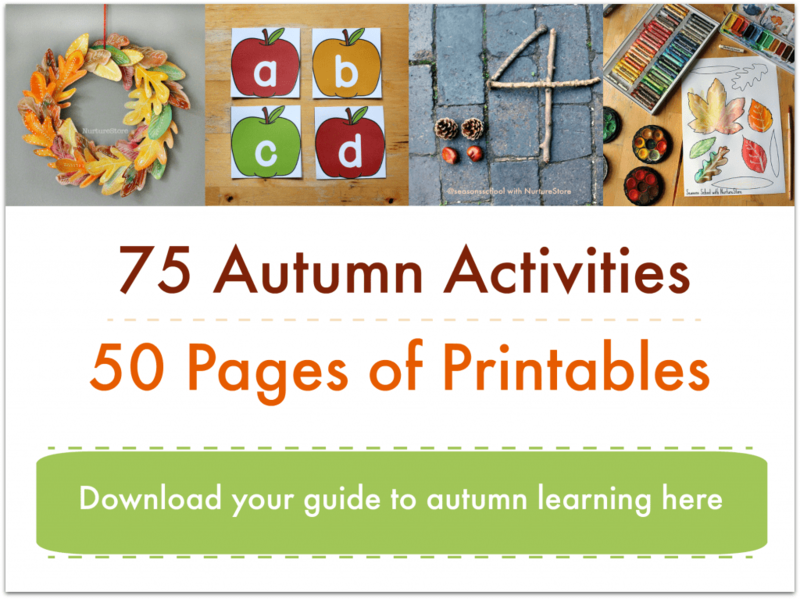 Click the image below if you’d like to print off a copy of our spider printable to use.